How can make web template in Photoshop. 1.Open photoshop & choose your web document(File-> New-> Preset-> Web-> OK). 2.Make your web page(graphics,logo,home page,about us,etc..). 3.Select SLICE TOOL & make 1st box. 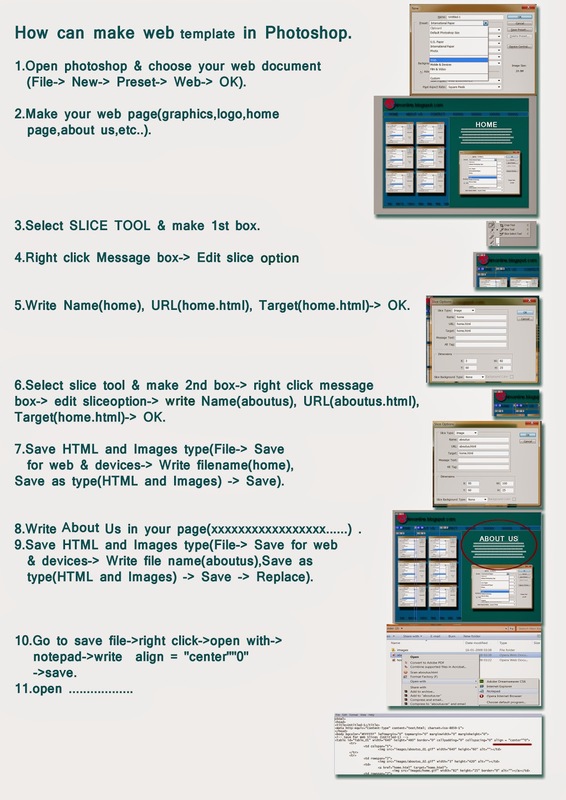 4.Right click Message box-> Edit slice Option. 5.Write Name(home), URL(home.html), Target(home.html)-> OK.
option-> write Name(aboutus), URL(aboutus.html), Target(home.html)-> OK.
name(home),Save as type(HTML and Images) -> Save). 8.Write About Us in your page(xxxxxxxxxxxxxxxxx......) . name(aboutus),Save as type(HTML and Images) -> Save -> Replace). 10.Go to save file->right click->open with->notepad->write align = "center""0"